When you speak to anyone about Gilmore Girls the first thing to state is usually what team you belong to, as in which one of Rory’s boyfriends was your favorite. There is Team Dean – Rory’s sweet first boyfriend; Team Jess – her bad boy second boyfriend; and Team Logan – her rich boy college boyfriend. Everyone has distinct reasonings behind their favorite, and what I’ve noticed a lot of lately are people who side with neither boyfriend, were more of a Team Rory. Let’s start on neutral grounds, at the beginning of “Winter.” we find out that Rory has been dating a guy named Paul, who everyone seems to think is forgettable, even Rory herself. Poor kid keeps getting forgotten in places, and throughout the year Rory is still technically in a relationship with Paul but she rarely thinks about him, is cheating on him, and keeps forgetting to break up with him. Until he breaks up with her in “Fall,” and you are reminded that hey, Rory had a boyfriend the entire time. Sigh, Rory is a terrible girlfriend. Then there is Logan, the longest relationship that she had in the original series and the last one. In “Winter,” we learn that when she is going to London on business, she is actually shacking up with Logan. The two have a sort of “what happens in Vegas, stays in Vegas” type relationship, with her dating Paul back home, and Logan is engaged to a French heiress. But as the series progresses, we learn that it’s more than just hook ups, Rory is emotionally attached to Logan as she phones him whenever something goes wrong and she needs someone to talk to. After she ends their affair, Logan with the help of the Life and Death Brigade (including my favorite member, Finn) give her one last night of debauchery – in a very long scene that made me look at my watch one too many times. However, this is the closure that Rory needs as she has one last night with Logan and bids him farewell. We’ve mentioned above, but Jess returns to Stars Hollow in “Summer” in order to save his mom and T.J. from a vegetable cult (I laughed out loud for this), but he visits Rory at the Gazette to encourage her to write a book. He is still working at his publishing company, and the scene with him at his book launch in season six is still one of my favorite scenes, his growth as a character was excellent and we get to see him doing a job that he loves. Him as a publisher, also ties in well with Rory writing a book, because you know that he will publish it. At least that networking worked better than getting Logan’s father to put in a good word for her with Conde Nast did. Jess has some lovely scenes with Luke as well, as the two of them have come along way too, since Jess was so reluctant for the help that Luke gave him. 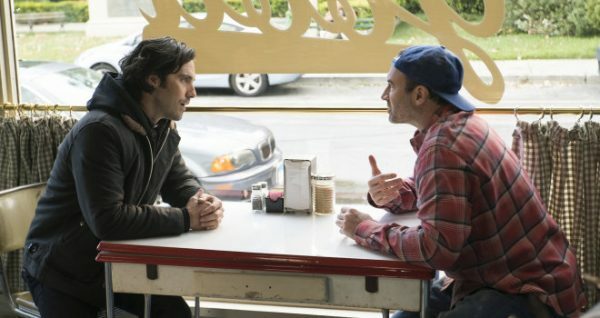 In “Fall” as Jess is visiting for Luke and Lorelai’s wedding, Rory excitedly tells him that she has written three chapters of her book and Luke asks Jess if he is over the Rory thing and he responds with “long over” But we see him looking longingly at her through the window suggesting that he might not be as “over” her as he pretends to be. Lastily, there’s Dean, who we get one scene with in “Fall,” Rory runs into him at Doose’s Market, of course, after she ends things with Logan. Dean is in town to visit his parents and we learn that he’s married again (thank god, Lindsay is out of this nonsense), happily this time, with three kids and one on the way. He looks so happy, that it makes one ponder how good a Rory-free life could actually be. Rory tells Dean about her book and asks his permission to write about him, telling him that he was the perfect first boyfriend that he taught her what being safe meant, that she wished that she had met him when she was older. It was a lovely send off to that relationship and a great way of honoring it. It would have been great if Rory’s whole romance debacle had ended with Paul’s breakup text at the end of “Fall” with the door closed on Logan, closure with Dean, a maybe with Jess, but still hope that there might be someone new but the last four words changed everything. I don’t think I have ever sighed as loudly as I did when Rory uttered those words. We have come full circle. I think it’s safe to assume that the baby is Logan’s, it also makes a scene where Rory meets with her father and she asks him whether he regrets not being involved in raising her, a lot more interesting. Amy Sherman-Palladino, the creator, originally said she created Logan to be to Rory what Christopher was to Lorelai – rich, entitled, fun, and irresponsible. If Rory is pregnant with Logan’s baby and Logan has no intention of leaving Odette, it’ll mean that Rory will have to raise her child as a single parent just like Lorelai had to with her. However, Rory is not sixteen and poor, she is 32, she has her grandmother, her mother, and the whole town of Stars Hollow helping her. This also means that the toxic relationship between Logan and Rory is probably not over. Is this the only sort of closure we will get for Rory, that she will have her own child? Is this open-ended? Or does Sherman-Palladino intend to expand on this story? I’m not of the school that wants to see this play out onscreen, I don’t want to see Rory being the Lorelai to Logan’s Christopher with Jess or some other schmuck playing the Luke role, waiting in the wings for a Gilmore girl to get over their fascination with rich, entitled rebels. Perhaps this is all we get, we can make up our own future for Rory, maybe you choose to believe that Logan leaves Odette, and him, Rory and the baby live happily ever after in London. Or maybe you want to believe that the child is not Logan’s. Or maybe that Rory raises the child with Luke and Lorelai, or with Jess, or even Kirk. You can choose your own best case scenario. Click next for our final verdict on the revival.